the left to view a larger image. Kansui. Contemporary, Ivory frog with double inlaid eyes. SOLD. Masatomo. (May be an added signature). Ivory standing unusual figure wearing a hat and holding a begging bowl. 19th Century. SOLD. [INV # 2206] Soya (pupil of Joso). Boxwood, with inlays. A standing sage carrying his gourd and staff. SOLD. [INV # 1589] Masashige. 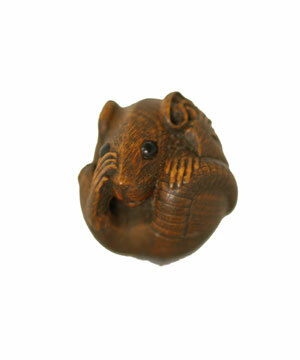 Boxwood classic style balled rat, inlaid eyes, in the style of Masanao of Ise/Yamada. 19th Century. SOLD. Ohara Mitsuhiro (1810-1875). Ivory as a gourd cut and decorated to be a drinking cup, with a small gourd on the bottom that forms the himotoshi. 19th Century. SOLD. Masatoshi ( - 200??) , "Sanbaso." Hippopotamus tooth, "The design is a moji-e, a design formed from the written characters or characters which stand for the subject. . . . Sanbaso, the felicitous dance prelude to a traditional theatrical performance." 1971. Illustrated, The Art of the Netsuke Carver, #351. SOLD. Masanao of Ise/Yamada. Boxwood Jurojin, one of the Seven Happy Gods, standing with his accompanying recumbent deer, a symbol of longevity. 19th Century. SOLD.